It was a perfect Saturday evening in the North End. None of the food at the Feast tempted us, so we went to Bricco for dinner instead. The front of the restaurant was completely open and we sat at a table perfect for people watching. 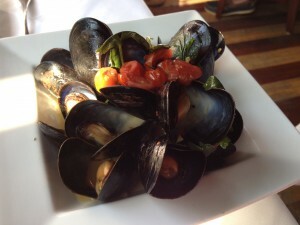 We started with the mussels (steamed Wellfleet mussels with garlic, caper berries & olives, $15). It was a small serving, but plenty of flavor. 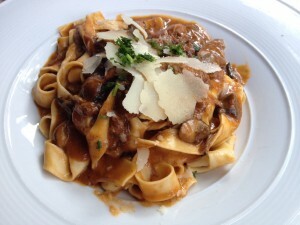 The Pappardelle al Cinghiale (wild boar braised in red wine with porcini mushrooms, $22) was meaty and hearty. This was my favorite dish of the meal. 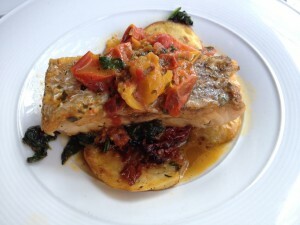 We finished with the Striped Bass (acqua pazza style, tossed organic spinach and sundried tomatoes with roasted yukon gold potatoes, $38). Steve loved the potatoes. I thought the fish was okay, not great. Our service was proficient and Steve enjoyed his wine.